The older a woman gets, the harder it becomes to lose weight. At 50 years old, your body doesn’t burn calories the way it did when you were younger. You may have cut back on your activity level because of health issues or family and work responsibilities. The fact is, too, your metabolism slows down as you age. If you’re still eating like you’re 20 but exercising like you’re 80, you need to find the right balance of energy intake and output -- along with the best food choices -- to help you lose weight at age 50. Talk to your doctor if you’re embarking on a weight-loss diet, to make sure it’s safe for you. After age 20, your daily energy expenditure decreases by about 150 calories a decade, due to your body losing muscle mass and gaining fat. The decrease, says the American Council on Exercise, becomes most dramatic for women when they hit 50. That means if you easily burned 2,000 calories a day when you were an energetic 20 year old, at 50 you may only be burning about 1,550 calories daily. Your daily caloric intake should depend not only on your age and gender, but also on how physically active you are -- the less active, the less you need. 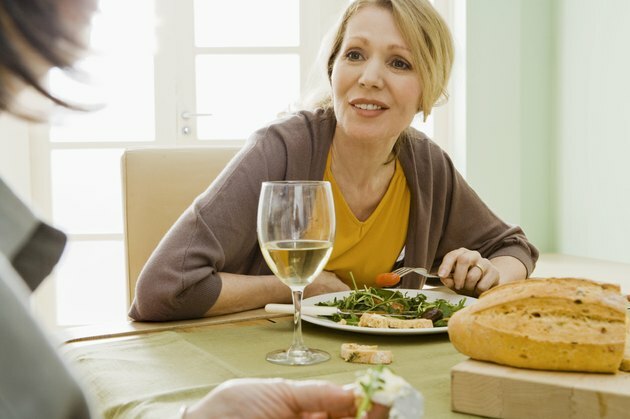 Registered dietitian Vandana Smith advises a daily intake between 1,600 and 2,200 calories for women in their 50s to maintain their current weight. Losing weight requires a different formula, however. To shed a pound a week, conventional nutrition advice is to increase your energy expenditure by 500 calories a day; you can accomplish this through a combination of less food and more exercise. However, recent research has been honing this formula for individual needs. If you find you’re not losing weight by cutting 500 daily calories, consult a dietitian for individualized help. If you’ve always been a burger-and-fries kind of gal and ignored the memo about healthy eating, it’s not too late to change your eating habits at 50, although you may be set in your ways. The poor food choices you were able to burn off 20 years ago will probably catch up with you as time goes by, and may wreak havoc with your health, in the form of obesity, cardiovascular disease and diabetes. Your best bet for losing weight at 50 is to ditch the processed and fast foods and to shift into a whole foods-based diet full of fruits and vegetables, whole grains, beans, nuts, healthy fats and oils, and lean protein. Whole foods give you a bigger bang for your caloric buck, tending to be lower in calories but higher in essential nutrients. For example, a medium baked sweet potato has only about 100 calories, while a medium serving of French fries at a popular chain weighs in at a hefty 378 calories. Unlike the fries, the sweet potato is loaded with vitamin A, a nutrient that supports your vision, and vitamin C, which helps you maintain healthy skin, blood vessels, ligaments and teeth. Sugar is a culprit in weight gain at any age, but especially when your metabolism has slowed down. Steer clear of empty, sugary calories from sodas and baked goods. Replace soda with plain or fizzy water flavored with fresh fruit slices, or have a piece of fruit or dark chocolate if you’re craving something sweet. Swapping just one 16-ounce cola daily for a glass of calorie-free seltzer saves you 207 calories every day. If you’re shooting for 1,500 daily calories to lose weight, you’ll have plenty to eat on a whole foods diet. Don’t skip meals, but spread your calories out through the day. Aim for protein and fiber at each meal, the two nutrients most associated with satiety -- that feeling of fullness that helps you stop eating. As a sample menu, start your day off with two scrambled eggs, a slice of whole-wheat toast with a tablespoon of almond butter, and a cup of fresh blueberries for 440 calories. At lunch, top 3 cups of spinach leaves with 3 ounces of grilled chicken breast, a cup of chopped veggies like bell pepper, and a fourth of an avocado for 228 calories; a dressing of 2 tablespoons of olive oil and vinegar adds 144 calories. Dinner could be 3 ounces of grilled salmon with a medium sweet potato and a cup of steamed Brussels sprouts for 277 calories; a pat of butter for the potato adds 36 calories, and a tablespoon of olive oil for the veggies comes to 119 calories. And there’s still room for a couple of snacks: Try an apple at mid-morning for 95 calories and an ounce of pistachios in the late afternoon for 159 calories. If you’ve shaved some calories from your menu earlier in the day, an ounce of dark chocolate feels decadent and costs you 170 calories. If you’ve fallen into sedentary habits, even a small amount of movement is going to help you burn calories and lose weight after 50. For best results, find something you like to do and will stick with, like brisk walking, biking or water aerobics, and aim for at least 30 minutes a day, five days a week. Sixty minutes a day of aerobic exercise produced better fat-loss results in one study of postmenopausal women, published in "JAMA Oncology" in 2015. For muscle toning and strengthening as you lose weight, do strength training -- lifting small weights or using resistance bands -- a couple of days a week. Remember not to overdo it, and make sure you stretch before any kind of exercise. If you have a medical condition, consult your doctor before implementing an exercise plan. European Food Information Council: What Makes Us Feel Full?